An awesome chat with the wonderful Weddings and Events Coordinator, Alysha. I get the lowdown on this awesome spot to host your wedding. At the top of my list was Revival House here in Stratford. I have always had a great time there, and really love Alysha their wedding and events coordinator. I thought it might be a good idea to speak with her and ask a bunch of the common questions that brides do, in order to help out couples that are considering revival house for their wedding. The trouble is, I’ve never been a bride myself. So what to do? Well I consulted the friendly Google, and sought out a list of excellent questions to ask potential wedding venues. After cherry picking what I thought were the best questions across a number of lists, I fired the questions over to Alysha so that she could see them and told her I would come and see her soon. Fast forward a couple days later, I visited her at a Revival House on a very quiet Wednesday afternoon. And we got to chatting. Fortunately I brought along my recorder, that I use for another podcast I do with a buddy and recorded the conversation. I was thinking that I might just use it as a reference guide to write this article, however our conversation went so smoothly and it was so easy that I thought I might just upload that. You can play the audio right here from the page, or click the download button. On mobile, CLICK HERE for download. 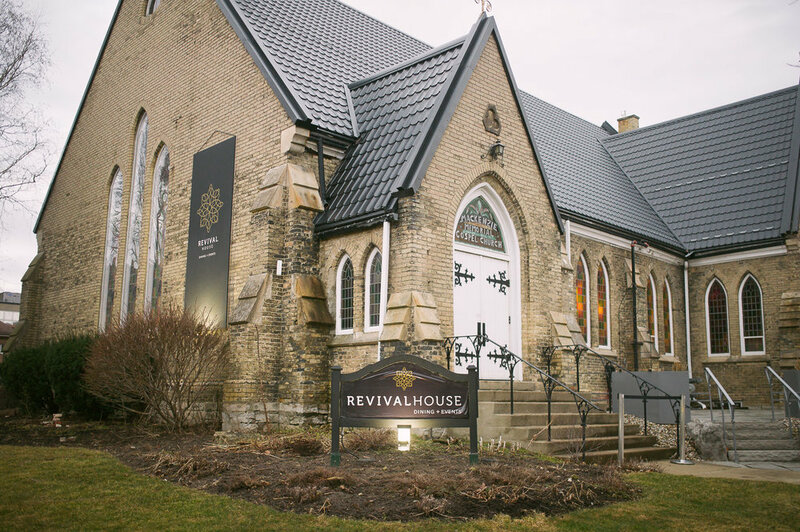 Revival House is a super cool spot to have your wedding. It is suitable for ceremony, cocktails and reception. It looks amazing during the day, and is super cozy and romantic in the evening. It has the best of everything. Old church, but with modern restorations and amenities. Wedding photography wise (take it from me, as a photographer) this place is a dream come true. They are really easy to deal with, and can do it all. You are in great hands with Alysha, their coordinator who has been planning weddings since her teens. The owners are very hip. A husband and wife team. Rob and Candice Wigan. Rob a.k.a. DJ WIGS is available as Dj, to make sure your party is bangin', but they are open to having other Djs in as well. If it was my call, I'd just pull the trigger on Rob, he's a serious powerhouse from the big leagues, punching above his weight for a small town, having been on the national scene and will leave you're dancers wanting for nothing. Food? They've got you covered, as their head Chef Loreena Miller is a Stratford Chef school graduate. You'll get a chance to taste their food on a DATE NIGHT, for a food tasting. Have an actual dinner, just the two of you in their fully functioning restaurant, instead of joining 30 couples at the same time for a tasting. For the wedding, your menu can be completely customized: Plated or a really classy family style serving is available. Trained professional waitstaff will serve guests from a fully stocked, impressive bar. This place is a high end restaurant as well, so you can expect the trappings that come along with it. That goes down to the tables and chairs and place settings as well. Everything is high-end and nice. You're not gonna have to worry about table and chair covers, or any of that jazz. You could decorate, certainly but I think in general there isn't a large need. The place has got great "bones", isn't that a term they use? I don't watch those reno shows, but I feel like that is something they say. Maybe just something they say when its structurally good, but has horrible wallpaper. That's not the case here, it looks great through and through. A super cool and very private B&B called The Three Houses is a 30 second walk away, and can serve as a great staging ground from getting ready to honeymoon sweet. Ample parking, signage and accessibility. Its also right downtown, and is within a super short walk to all kinds of cool things for guests to do. Remember it's a tourist town after all; The well known Rheo Thompson's Candies is about a 60 second walk. Real candles are allowed, with some minor conditions. This place is very much in demand, if you are looking to book, I'd suggest pulling the trigger as soon as you know, the average wedding is booked 16 months in advance. They also recommend a pretty stellar photographer (that's me) / shameless plug.